Accurate knowledge of the transmitted radiofrequency field (B1+) may play a crucial role in 3 T CMR for pulse sequence calibration, image-based quantitation (such as in first-pass myocardial perfusion imaging), and contrast optimization. 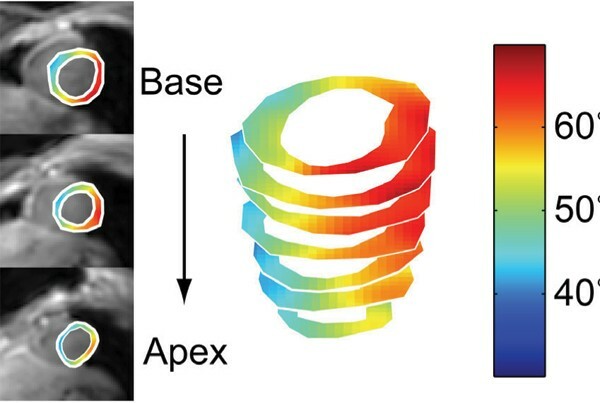 A rapid and volumetric B1+ mapping method was recently developed  and applied to 3 T cardiac imaging in healthy volunteers . In this study, we apply the same technique to evaluate B1+ variation in cardiac patients at 3 T.
The single breath-hold cardiac B1+ mapping sequence previously described  was incorporated into the clinical 3 T cardiac MR protocol at our institution. B1+ maps were acquired after localizing scout scans. The sequence was prescribed to cover a stack of 10 to 12 short-axis slices perpendicular to the long axis of the left ventricle (LV) to include the entire LV. Experiments were preformed on a 3 T Signa EXCITE HD system (GE Healthcare) in five patients scheduled for routine CMR (heart rate: 75 ± 8.7 bpm), using the body coil for RF transmission and 8-channel cardiac phased array coil for signal reception. The transmit gain was calibrated using the standard pre-scan process. The acquisition parameters were: 2.6 ms sinc RF pulse, TE = 2 ms, TR = 7.2 ms, FOV = 30 cm, in-plane resolution = 5 mm, slice thickness = 5 mm. A Hamming window was applied to k-space data during reconstruction. All data analysis was performed in MATLAB (The Mathworks). Regions of LV myocardium and blood pool were manually segmented based on magnitude images. The mean, standard deviation (SD), minimum (αmin), and maximum (αmax) flip angle across the whole LV were measured for each subject. The metric SD/mean (%) and (αmax-αmin)/αmax (%) were used to quantify the flip angle variation. Figure 1 contains flip angle maps from one representative cardiac patient. Magnitude images are provided for anatomical reference and overlapped with the colored flip angles. The stack of observed flip angles in the short-axis view illustrates the overall flip angle variation over the entire LV myocardium with a prescribed flip angle of 60°. The pattern of variation qualitatively agrees with previous observations in healthy volunteers (smooth and unidirectional) . Table 1 contains the statistical parameters for all five patients. The amount of B1+ variation, (αmax-αmin)/αmax, ranged 40% – 56%. Compared to healthy volunteer results (31% – 56%) , the patient data show slightly larger flip angle variation. Short-axis flip angle maps from one representative cardiac patient. Note that the prescribed flip angle was 60°. Measured flip angles and flip angle variation across the entire LV in 5 cardiac patients. Substantial B1+ variation across the left ventricle at 3 T was observed in patients, although the amount and pattern of variation was comparable to that observed in healthy volunteers. With a larger patient dataset (>30) forthcoming, we expect to offer more statistically meaningful information. Because of the substantial variation observed at 3 Tesla, B1+ mapping may have a valuable role during pre-scan calibration for 3 T CMR.